Donostia-San Sebastián. 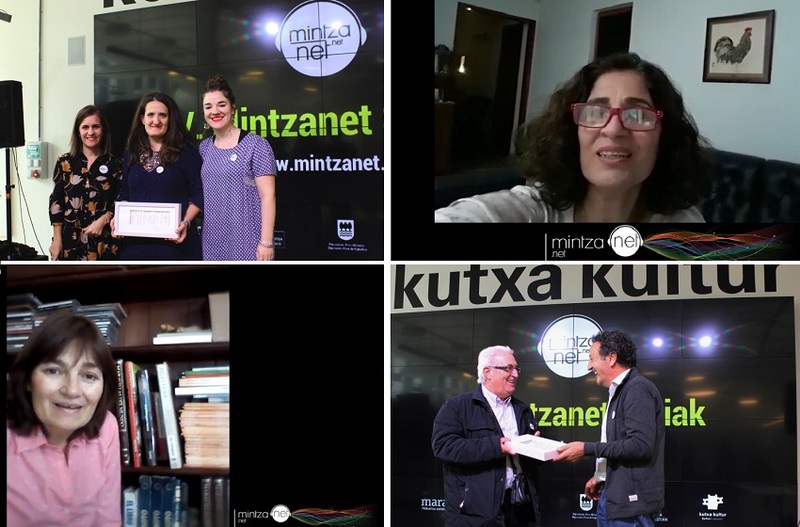 The Mintzanet platform, a place to practice Euskera online for free, presented its awards for the fifth time. In the 2018 edition, the distinction for the best “bidelagun,” or native language conversation buddy, went to Ainara Maia from Irun. The award for the best “bidelari,” the person who learns practicing to improve his/her level of Euskera, went to Peio Duzan, from Strasbourg. This year, the platform also gave a honorable mention to “bidelagun,” Joxe Mari Allur, who is originally form Lazkao, Gipuzkoa. The bidelaris (and euskara teachers) in Argentina Begoña Tisera and Elisabet Echegaray who enjoyed the company this year of Ainara Maia and Joxe Mari Allur respectively, didn’t let the opportunity to pass and both sent congratulatory videos for the recognition received. Begoña Tisera is in San Nicolas and entered the Euskara Munduan program in 2013, through her local Basque club. Besides teaching classes, Begoña travels to Rosario and San Pedro where she also teaches Basque at the National University in Rosario and at both Basque clubs. Elisabet Echegaray is in Azul, and has taught Euskera for several years in Argentina. She entered the Euskara Munduan program through the Gure Txokoa Basque Club in Azul in 2008 and has taught not only in Azul but also in Rauch and Olavarria. Zorionak to the honorees!